August is here and as usual my summer begins to feel a bit panicky right about now. Summer is so very fleeting here in Vermont, that I never feel like we can fit it all in: picnics and swimming and puppet shows and berry picking and parades and the Farmer’s Market and the circus and- and- AND! Technically it’s just the beginning of August, but when I look at my calendar all I can see is a high-speed runway leading directly up to the first day of school. So the other day I answered a question that’s been bothering me since we began the No Sugar project: how important is sugar to a bread recipe? I’ve been a royal pain-in-the-tookas on this one, refusing bread in restaurants over the protestations of well-intentioned waitstaff that the amount contained therein was really, very, very small. Always, there was the implication that the bread simply couldn’t be made without the sugar. I wondered, was the sugar somehow necessary to proper yeast growth? How much better would bread made with sugar really be? I set out to find out. Using my King Arthur Flour cookbook, I prepared two batches of bread dough: one adding the called-for tablespoon of sugar in the yeast-proofing stage, the other not. During the process of the rising, kneading and baking I became convinced the sugar-containing bread would win in a walk. The yeast looked bubblier, the dough rose better, the final loaf had a better browning on the crust. But it was like the story of the tortoise and the hare… despite looking somewhat sad and anemic throughout the entire making and baking process, in the end I found that the no-sugar loaf caught up. By leaving it in the oven a few minutes longer I got the desired browning on the crust… the loaves looked indistinguishable. When I held a taste test composed of my family and some friends, two preferred the sugar-bread, one preferred the no-sugar bread, and one said they tasted the same. Clearly the difference was subtle. Can you make good bread without that tablespoon of sugar? Yes. The Difference An Egg Can Make! Then this week I returned to a snack/dessert recipe I’ve always loved: Apricot-Lemon-Date Bars. I had made these much earlier in the year, substituting banana for the brown sugar, which works fine, but results in a very banana-date-y taste which- if you sweeten everything with bananas and dates for a while, like I did- gets pretty monotonous after awhile. I returned to the recipe, this time armed with my giant container of dextrose. 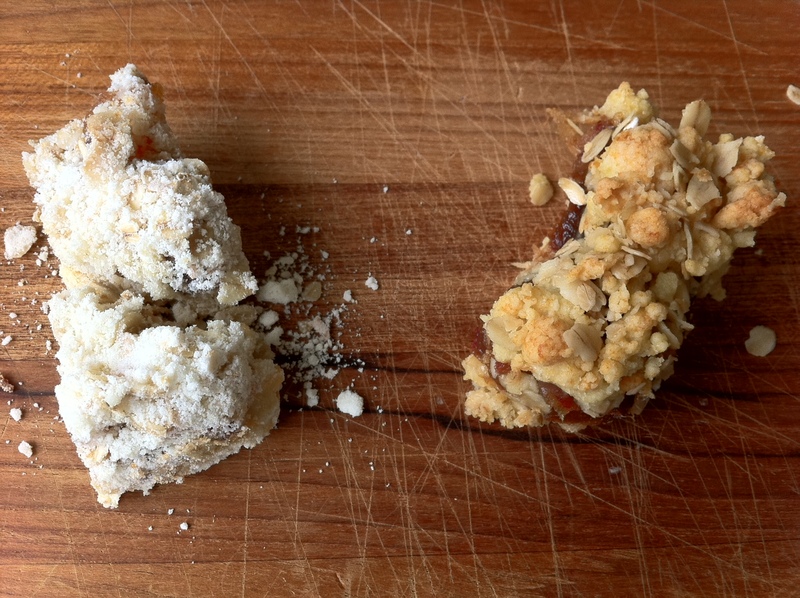 The first time through, however, was disappointing: making the recipe by simply substituting dextrose for brown sugar resulted in a pasty, overly crumbly mess of a bar, which tasted okay but didn’t hold together nicely and didn’t brown in an appealing way. Back to the drawing board. Between the dextrose and the dried apricots and dates the bars were plenty sweet, but what would make the crust hold together better and brown better? I decided to try adding one egg to the crust and see what happened. Now, this is kind of a big deal for me. As I’ve mentioned before, I’m a recipe follower; I’m very literal. I’m the kind of cook who waits the last ten seconds on the timer before dumping the pasta water out. Experimenting is entirely outside my comfort zone. However, I am living proof that being hungry and sweet-deprived will do wonders for one’s adventurousness in the kitchen. You know what? It worked! The egg added just the right cohesiveness to make the crust crumbly rather than dusty, and the browning was perfect. They’re not just good- they’re really good! I am so proud of myself that it’s kind of ridiculous. You’d think I just invented the S’mores Kit. I use dextrose in my bread instead of sugar……….it rises even better than sugar because dextrose is used in beer making instead of sugar because it reacts better with the yeast. Ooo! Now THAT never occurred to me! Thank you- I will try that. Your’er very welcome Eve, I am really enjoying your blog on your year without sugar. I read David Gillespie’s books, “Sweet Poison” and “The Sweet Poison Quit plan” and went fructose free six months ago. It’s been an interesting six months and I feel so much better for it. We are going to Europe next year and I was glad to see how you found it in Italy with staying mostly sugar free. I look forward to reading your journey in the future. in the no sugar fruit bars is that 2 cups each of dates and apricots or 2 cups combined? You are currently reading A Year Of No Sugar: Post 63 at Eve O. Schaub.